*NORC at the University of Chicago is not currently accepting applications for this opportunity. Please see the Track C tab under the Learning Collaborative for information about our upcoming opportunities. 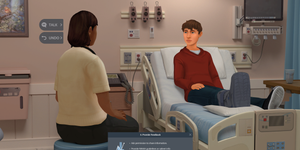 The American Academy of Pediatrics recommends adolescent substance use screening and education as part of routine care, using the universal Screening, Brief Intervention, and Referral to Treatment (SBIRT) process endorsed by the Substance Abuse and Mental Health Services Administration (SAMHSA). However, many health professionals report having little time, training, tools, and treatment resources to conduct SBIRT with adolescents for use of alcohol, tobacco and other drugs. 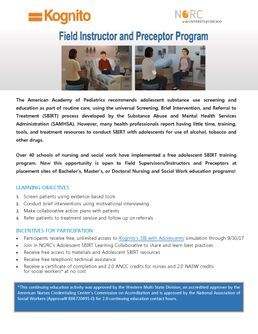 *This continuing education activity was approved by the Western Multi State Division, an accredited approver by the American Nurses Credentialing Center’s Commission on Accreditation and is approved by the National Association of Social Workers (Approval # 886720495-0) for 2.0 continuing education contact hours. Know other Social Work Field Instructors or Nurse Preceptors who would be interested? Download this flyer to share with your colleagues and link to our online application today! 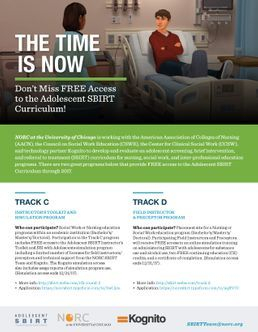 With funding from the Conrad N. Hilton Foundation, NORC at the University of Chicago is working with the American Association of Colleges of Nursing (AACN), the Council on Social Work Education (CSWE), and technology partner Kognito to disseminate adolescent screening, brief intervention, and referral to treatment (SBIRT) curriculum in nursing, social work, and inter-professional education programs.